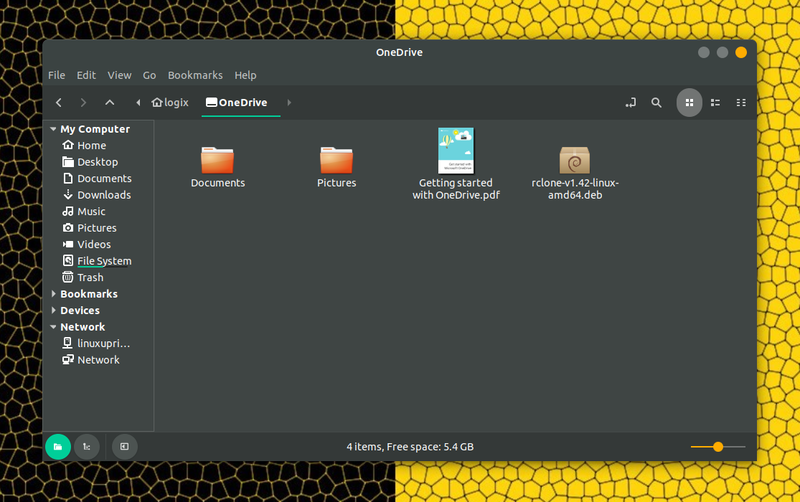 Microsoft OneDrive doesn't have an official client application for Linux, but you can access your OneDrive files from a file manager on Linux thanks to a third-party tool called Rclone. 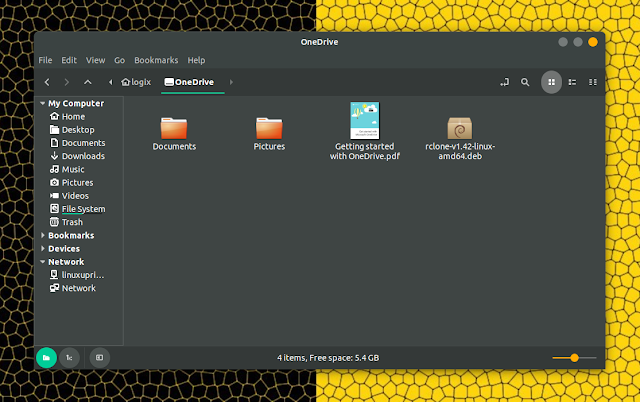 This article explains how to mount OneDrive in Linux using Rclone. Microsoft OneDrive (previously SkyDive) is a cloud storage / file synchronization service, part of the Office Online suite. It offers 5 GB of storage free of charge, with additional storage available with a paid subscription. Rclone is "rsync for cloud storage". It can synchronize files not only from your filesystem to the cloud (and the other way around), but also from one cloud storage service to another. The tool supports a wide variety of cloud storage services, from Google Drive to Amazon Drive and S3, ownCloud, Yandex Disk, and many others. Besides on demand file synchronization, Rclone supports mounting any supported cloud storage systems as a file system with FUSE. While this feature exists for some time, it's still considered experimental, so use it with care. After mounting Microsoft OneDrive, you'll be able to access it from your file manager, be it Nautilus (Files), Nemo, Caja, etc. The behavior is similar to the one explained on our article about Google Drive: Mounting Google Drive On Xfce Or MATE Desktops (Ubuntu, Linux Mint). As a side note, you can also use Rclone to mount Google Drive in Linux. Rclone supports OneDrive for Business / Office 365. However, if the organization is in an unmanaged state (not verified by the domain owner), you won't be able to mount OneDrive using Rclone with FUSE. Such accounts can be used with Sharepoint though. See this page for more information. OneDrive is case insensitive, so you can't have two files with the same names but different cases in the same folder (example: MyFile.txt and myfile.txt can't be in the same folder). Also, renaming folders doesn't seem to work, at least on my system. I'm not sure if this is a Rclone issue or limitation, since Rclone is supposed to support renaming folders in general. These instructions should work not only on any Linux distribution (from Ubuntu, Linux Mint, or Debian, to Arch Linux, Fedora, openSUSE, and so on), but also on FreeBSD and macOS. It even works on Windows but you'll need WinFsp. You can download Rclone binaries from here. For Linux you'll find generic binaries, as well as DEB and RPM binaries. This was apparently fixed a while back but it looks like the issue occurs again. 2. Add a new OneDrive remote to Rclone. The instructions below may seem long but it only takes a few seconds to set it up. A new tab should open in your default web browser, asking you to give Rclone access to your OneDrive account. Allow it and you can close the tab. Rclone runs a webserver on your local machine (on port 53682) to retrieve the authentication token. You may need to unblock it temporarily if you use a firewall. Enter 0 and press Enter. You should now reach this screen - enter y to continue. 3. Create a new folder on your system that will be used to mount Microsoft OneDrive. I suggest creating a folder called OneDrive in your home directory. The instructions below will be using this as the mount point (~/OneDrive). 4. Mount OneDrive (with Rclone using FUSE) as a file system. Where onedrive is the name of the Rclone remote, followed by : (we've used exactly onedrive in the instructions above so you can use precisely that for the command), and ~/OneDrive is the folder where you want to mount OneDrive on your system. The mount command uses --vfs-cache-mode writes because according to the Rclone documentation, "many applications won't work with their files on an Rclone mount" without this or --vfs-cache-mode full. The Rclone file caching section explains this in detail. You can stop and unmount it by pressing Ctrl + C to close Rclone. Command: sh -c "rclone --vfs-cache-mode writes mount onedrive: ~/OneDrive"
There are other ways of mounting OneDrive automatically, like adding a line in your /etc/fstab file, using systemd, etc. As a starting point you can use the examples from google-drive-ocamlfuse, as they should also work for Rclone.